It makes the eyelids red and crusty and your eyes feel sore or itchy. The eyelids can become puffy. The symptoms are usually worse in the morning and it is not associated with damage to the eyes. Blepharitis is most common in people over 50, but it can develop at any age. As you get older, the tears contain fewer lubricants and your eyes can feel gritty and dry. 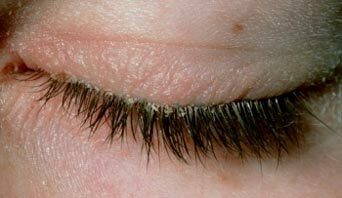 Firstly, if you have blepharitis, avoid eye make-up. There are treatments which can help you reduce the effects of blepharitis. You may need the treatment for several months. Warm compresses warm the material that blocks the glands and loosens the crusts on the eyelid, making them easier to remove. You can use a flannel as a warm compress, or you can buy an Eyebag from our Practice which you heat up in the microwave. Soak the flannel in hot, not boiling water, and place the flannels on the shut eyelids for five minutes, massaging gently with your hands. This will loosen the crusts, you can then use lid scrubs. Lid scrubs would be the initial treatment of the condition, it can be done as follows. Use a cotton bud moistened with cooled boiled water (from kettle) and baby shampoo (1 part to 4 part water) and gently apply the solution to the lashes. This procedure should be carried out daily to dissolve the oils causing the irritation. At Scher & Ward Opticians we advises a product called blephosol as a far more convenient and effective alternative. Using a comfort drop can help to lubricate the eye and make it feel more comfortable.